I know what you’re probably thinking: ‘another one?’. It seems you cannot walk down any of London’s streets without your eyes being assaulted by restaurant upon restaurant of niche and quirky vegan eateries. 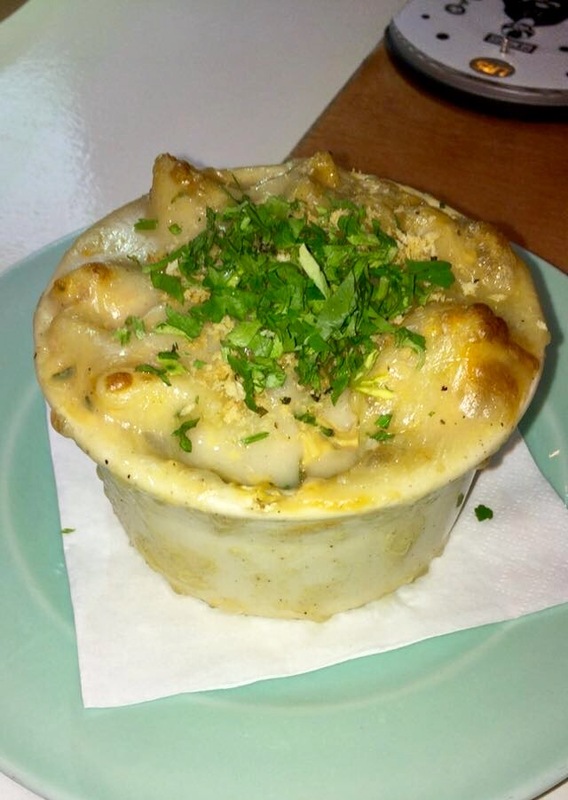 Shoreditch is the prime example; it is arguably the heart of the sprawling web of vegan pop-ups which is spreading across London. Neon signs lean out above these restaurants like hands trying to pull you in and seduce you. I have tried my hardest not to succumb to the lure of veganism, dismissing it as a passing trend. However, the fact more and more vegan eateries are appearing, suggests otherwise and that is why I went back upon my vow and entered the doors of ‘Genesis’. Its namesake, derived from the Hebrew Bible’s story of creation, made this restaurant a very fitting venue to pop my vegan cherry! Founded by Alex and Oliver Santoro of vegan company Raw Imagination, Genesis prides itself on providing being plant based dishes and as stated on the website, it specialises ‘in fast casual dining and organic comfort food’. As soon as my friends and I walked through the doors, I knew we had made the right decision. The walls are an explosion of cotton candy pink and potted cacti (of every size imaginable) litter every surface: the floor, tables, the serving counter, creating the perfect girly wilderness. 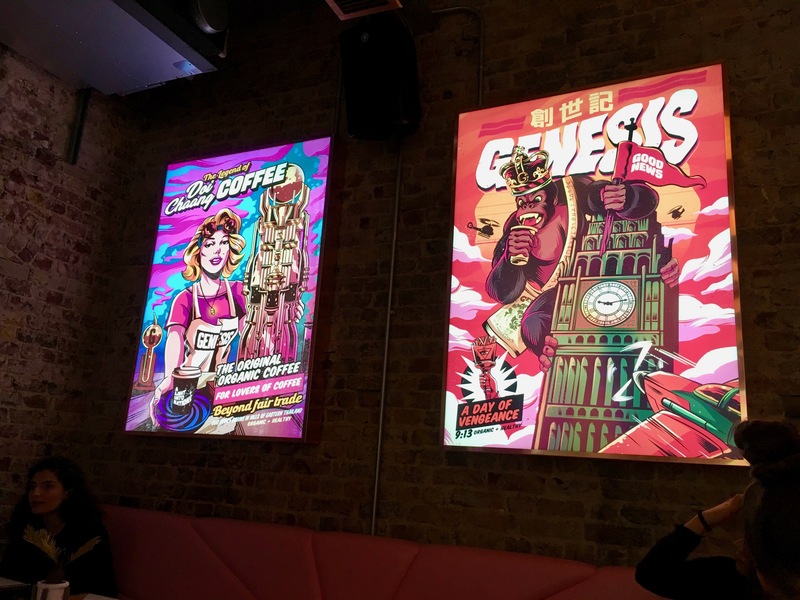 Pop art style artwork adorn the walls, the neon colours mingling with the moody lighting to create a subtle glow that adds to the restaurant’s chilled aura. This two-floor restaurant means there is room for everyone and shouts inclusivity through its eclectic menu which immediately catches your eye as you are seated. It is decorated with an illustration of Adam and Eve in the Garden of Eden on the front and back, giving you the impression that you are about to go on a journey as you open its pages. This is confirmed by the wide variety of food options that take you on a journey around the world, featuring the likes of fried avocado tacos, laksa soup, kale Caesar salad, aloo tikka chaat, banh mi hotdogs, and shawarma with Israeli salad for mains. Then brownie sundaes, bread and butter pudding and dairy-free soft serve ice cream all feature on the menu for dessert, as well as drinks such as cocktails, beers, soft drinks and milkshakes with the option to add supplementary Superfoods like Matcha. 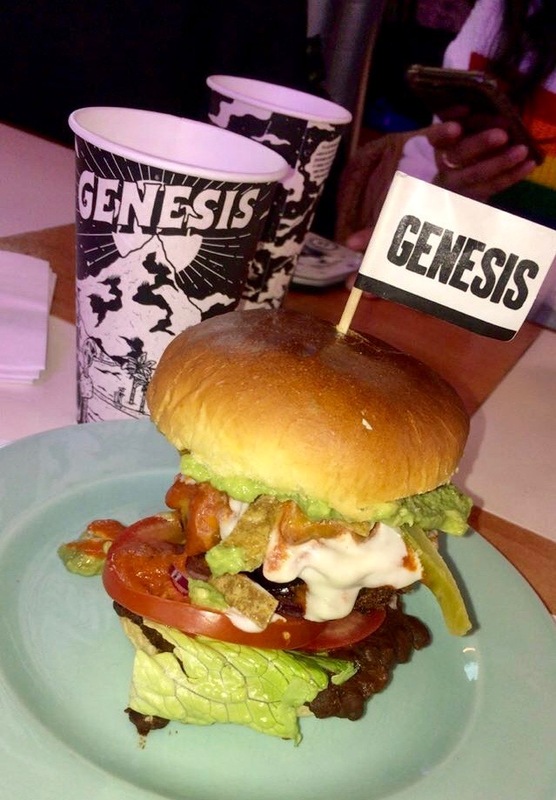 I personally opted for the ‘Torta Milanesa’ burger, otherwise known as the ‘Mexican Sandwich’ – a tasty and surprising medley of panko aubergine (in breadcrumbs), refried beans, lettuce, chipotle mayo, coconut cheese, tomatoes, cactus, avocado and tomato salsa cushioned top and bottom with a brioche bun! I was intrigued by the inclusion of cactus in this beast of a burger and can happily confess it wasn’t as prickly or as nasty as I imagined – I would compare it to a snazzy gherkin! My friends opted for the original ‘Genesis Burger’ and the ‘Sauerkraut Dog’ with ‘Cheese Sticks’ and ‘Kamut Mac & Cheese’ as sides. The dishes were as scrummy and groovy as their names sound – we were all left feeling content and with a pleasant glow spreading across our cheeks having defeated the generously sized portions. Take home point: do not let your prejudice get in the way of delicious, nutritious and healthy food. Just because you opt to be vegan for one day, it doesn’t mean you have to go vegan full time. My friends and I are already planning our next visit to travel somewhere else around the globe through the culinary delights the menu offers. What would you choose from the menu? Answer in the comment section below. This restaurant isn’t ideal for people who suffer from nut allergies as nuts form the base of many of the substitute ingredients.